Debut show: 2016, 11.29th, 7.30 p.m.
gold extra's Open Studios have often been the place of sensational discoveries and ground-breaking insights. This time we approach the timeless mystery of the Tyrolian struggle for freedom. Is the time ripe for the whole truth about Andreas Hofer? A hero being so strongly guarded against reinterpretations that doing so could earn the culprit factually our weeks jail (or a fine of 72,67) in Tyrolia. Acting from the conisiderably safer grounds of Salzburg, Brandmayr and Zechenter open up a time capsule from the Napoleonic Wars of Liberation and find astonishing details: Was there an Andrea Hofer? With a drunkard of a brother? With religious visions as Tyrolia's own Jean D'Arc? Will the marksmen and markswomen follow her or does she have to face the French army all by herself? Do you need a drink now? gold extra tells the secret story of the Tyrolian War of Liberaton and the scary story of the battle of the sexes, on time for the 250th birthday of the icon. 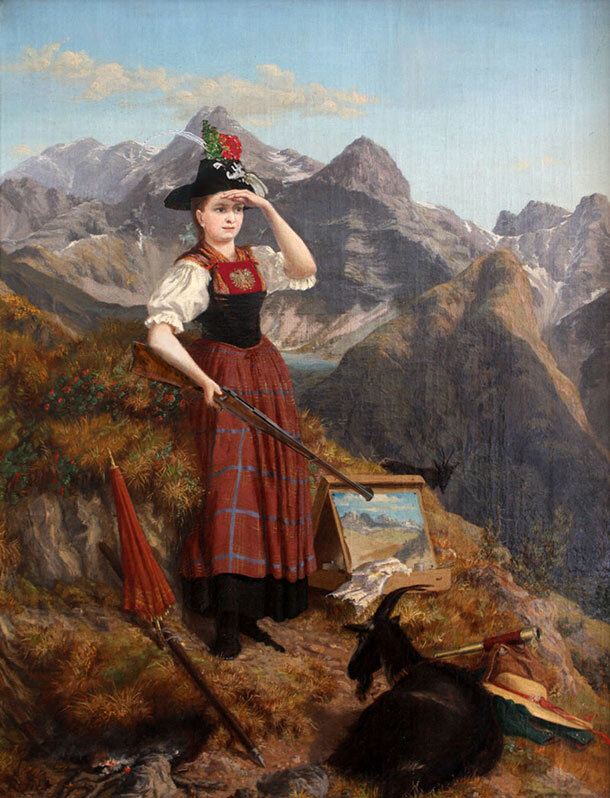 Our collage is based on the self-portrait of Anna Stainer-Knittel, successful artist, model for the myth-laden „Geierwally“ (Vulture-Wally) and early example of emancipation in the Alps.